As a substitute teacher, a week’s worth of school closings can really devastate your monthly paycheck. Unfortunately, that’s exactly the scenario I’m living right now. I had a week of full-day sub jobs at a local middle school that have all been completely scrapped due to the ridiculous snow we’ve been having here. Luckily, something mildly entertaining came out of it. On day three of our “Snowpocalypse”, I sat down and created a little cartoon. 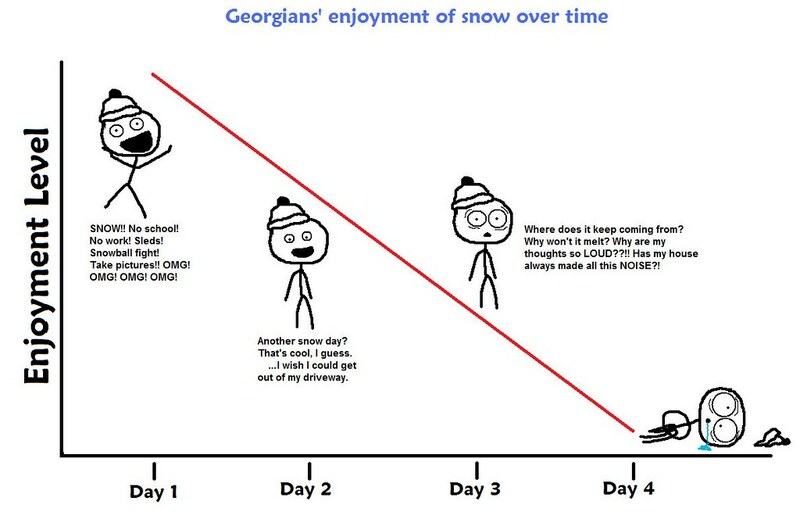 It was a simple graph that showed Georgians’ enjoyment of snow over time. I planned on just uploading it to my Facebook and sharing it with my friends, but within 48 hours, the flickr link to my cartoon had been reposted all over Facebook, racking up over 60,000 views and 50 or so comments and “favorites”. I even had a friend send me a message saying that one of her friends – a math professor – wanted to use my cartoon as an example of statistical linear regression. I guess it wasn’t a complete loss of a week. This entry was posted in Fun Stuff and tagged humor. Bookmark the permalink.